Bill Mayher’s fascination with birds dates back to the morning his grandmother showed him an ovenbird’s nest when he was five. His career as a fisherman commenced a few years later. With the classic kit– bike to get there, can of worms, Sears pole– these were the Huck Finn years. This era was followed by a decade of salt water fishing on Cape Cod, Martha’s Vineyard and the waters off Eastern Long Island where he worked on boats in a community of friends making their living as commercial fishermen and guides. Over these and subsequent years he also birded North America from the Yucatan Peninsula in Mexico to Attu, the eastern most island in the Aleutian chain, as well as in Europe, Central America, the Middle East and Africa. He hasn’t fished so regularly lately and these days he has probably created more fish than he has caught on hook and line. This balance seems right to him, and perhaps makes the ocean feel slightly less haunted. 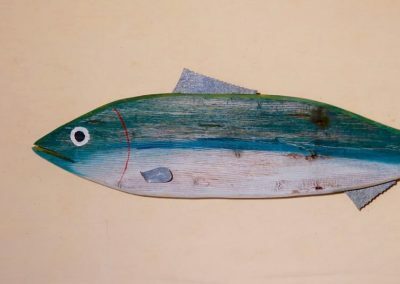 “When I am working on a fish I encourage the weathered aspects I find in the salt water-cured wood I gather on islands–its wabi sabi quality– reminding us that everything is in flux, impermanent, fragmentary. I feel very connected to fish. If I can get hold of the fishy essence of the thing I am working on, the piece seems to jump out visually. When you look carefully at a fish, there is just so much evolutionary design there, so much balance and harmony. A lifelong teacher, counselor and consultant, Bill is still involved with schools, lately in London, and most recently at The King’s Academy in Jordan. He also writes regularly for WoodenBoat and Maine Boats Homes and Harbors magazines and is the author of The College Admissions Mystique and Joel White: Boat Builder, Designer, Sailor with Maynard Bray and Ben Mendlowitz. A year ago he and four others launched the classic boat website, offcenterharbor.com. Bill and his wife Caroline, a potter, have been around Maine’s Blue Hill Peninsula since the late 1960s. Between 1979 and 1980 they designed and built their own house in Brooklin where they work in their own shops and keep an eye on the comings and goings of the tide.